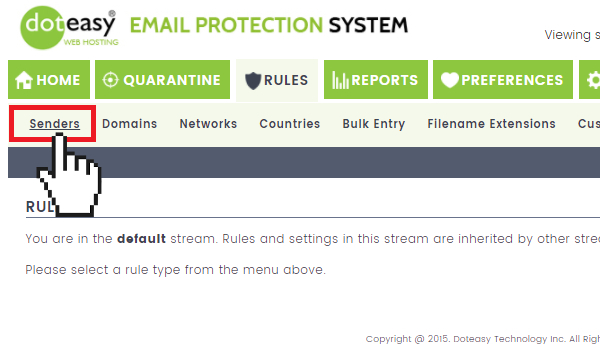 The Doteasy Email Protection system comes with the ability to set message rules based on the sender’s email address. These rules control how your email messages are filtered. 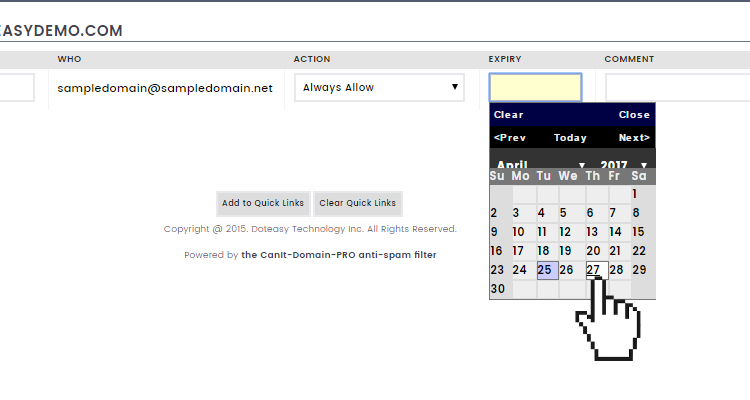 You can create filtering rules from your Doteasy Email Protection system dashboard. 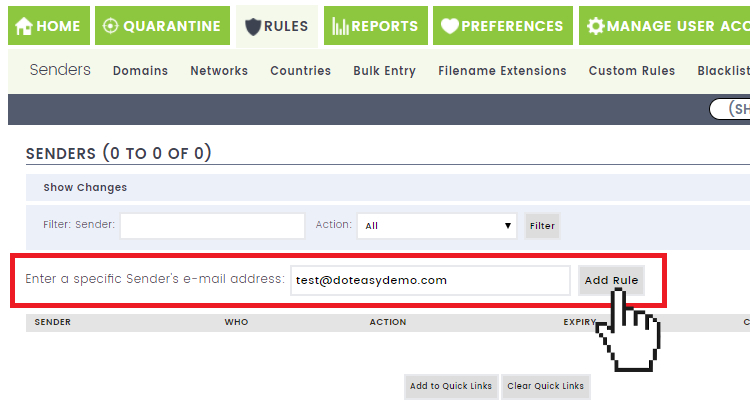 The Doteasy Email Protection system allows you to take specific actions based on the sender’s email address. These rules are called Sender Rules. Log in to your Doteasy Email Protection system dashboard if you haven’t already done so. 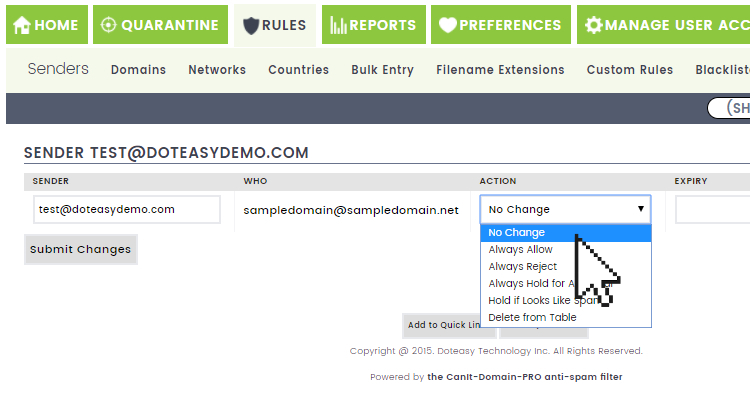 Click on Rules from the top menu and select Senders. On the Senders rule page, enter the email address of the sender in the Enter a specific Sender’s e-mail address field. After you’ve entered the sender email address, click Add Rule. Always Hold for Approval – email from this sender is always held for approval, even if spam-scanning does not flag it as spam. The Expiry field allows you to set an expiry date for the action rule. If you want to the rule to remain permeant, simply leave the Expiry field blank. If you want the rule to stop after a specific date, enter the date in the format YYYY-MM-DD or use the date selector to choose the rule’s expiry date. If you wish, enter a comment in the Comment field. You can use this as a reminder why you allowed or blocked a sender. When ready, click Submit Changes. 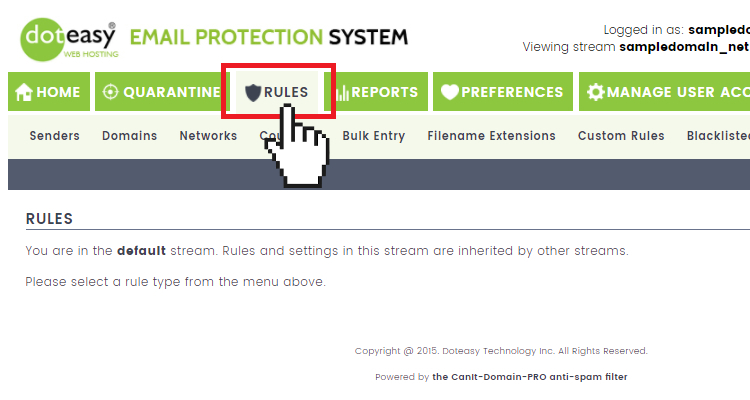 Once you have submitted the Senders rule, it will be added to your Doteasy Email Protection system Rules > Senders page. You can edit the rules. Simply make sure to click Submit Changes to save the changes.